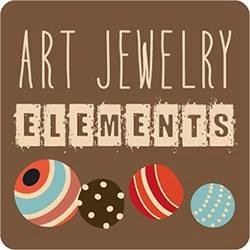 It's yet the end of another month, and that means it's the reveal day for the Art Jewelry Elements Component of the Month. For April, Rebekah Payne of Tree Wings Studio provided us with these cute little polymer hearts! If you love them, she has them available in her shop! I asked Rebekah to send me a surprise, and I received a copper one! As usual, I stared at the bead, stumped, for the better part of the month. Feeling under the gun with many blog and personal and work deadlines, I was finally able to come up with what I wanted to make after looking at another piece I had made quite a long time ago! These stone beads caught my eye on my dresser, and that was it. I knew what I was going to make! They match perfectly with the heart! I added some pretty copper accent beads, and a copper clasp. I'm really happy with the way this came out! I will happily be wearing it! Thank you so much Rebekah for another month of inspiration! Check out what everyone else made with their little heart! What a really lovely bracelet, the colours go together so beautifully! Your bracelet is beautiful, the stones you chose match the heart so well. It's like a treasure found at the bottom of the ocean. I love the colors in the beads that you used. Copper just sets them all off beautifully. Those beads were just waiting for that heart to come along, they're perfect together! I love it! Your bracelet is lovely! Rebekah's heart works so well in many styles and necklaces and bracelets alike. I love the beads you chose to go with it! You are right those stones are perfect. This is stunning. Ooh - the copper heart and the copper swirls in your beads. YES! Love it.